But, whatever your reason, Internet Explorer also lets you turn off and disable AutoComplete altogether, with granularity: you can keep AutoComplete for some things like the address bar, but stop it for form fields, as we'll explain in this tutorial. When the "[Internet] Options" dialog opens, click on the "Content" tab. The "Address bar" checkbox is checked by default, which means that Internet Explorer will help you find your target content from any source that is checked below it ("Browsing History", "Favorites", and "Feeds"). 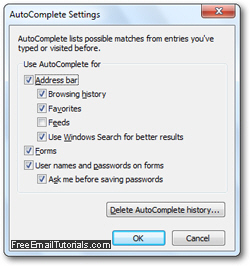 To turn off AutoComplete completely for the Internet Explorer address bar, simply uncheck that checkbox - alternatively, uncheck just the data sources you don't want to use for auto completion. If you no longer want to let Internet Explorer remember your user names and passwords for login forms on the web, uncheck the corresponding checkbox below. And that's it, configuring or disabling AutoComplete in your web browser is just that easy. If you ever want to go back and re-enable AutoComplete in Internet Explorer, just follow the steps we outlined above, and this time check all the features you want to resume using!